Good wallet. I bought this for my son for Christmas and he loved it. He uses it everyday. With my Club O rewards I saved even more money and got free shipping. Great Value. Safeguard your cash and cards with this simple and practical trifold wallet. The wallet's genuine leather construction houses multiple slots and pockets, offering ample space and convenient access. I want to give this five stars, but had to go with four. Although the quality is really very good, the wallet itself is rather short in height. It has the "see through I.d. pocket", which is standard in men's and women's wallets, but the card slots aren't graduated, so you have to dig through the cards to find what you're looking for. This can be an issue, as the cards rub against each other and affect their surfaces; front & back. Also, as I said, the height of the wallet is DEFINITELY shorter than my husband's previous tri-fold wallet. Because of the card slots not being graduated, and there are fewer card slots to begin with, there is less material used to make the wallet itself. If you carry fewer cards, this will be a great fit for you. But, if you have a "busy" triI-fold, (credit cards, work identification cards, store and restaurant bonus cards, photos, etc.) this probably isn't the wallet for you. This wallet is well packaged for gifting, and sold at an excellent price. This item came quick and on time! It is of good quality leather! everybody loves the new leather smell right? I got the tan one which is a nice alternative color to what most other brands wallet colors are. They also have some other nice colors too. It fits lots of credit cards! 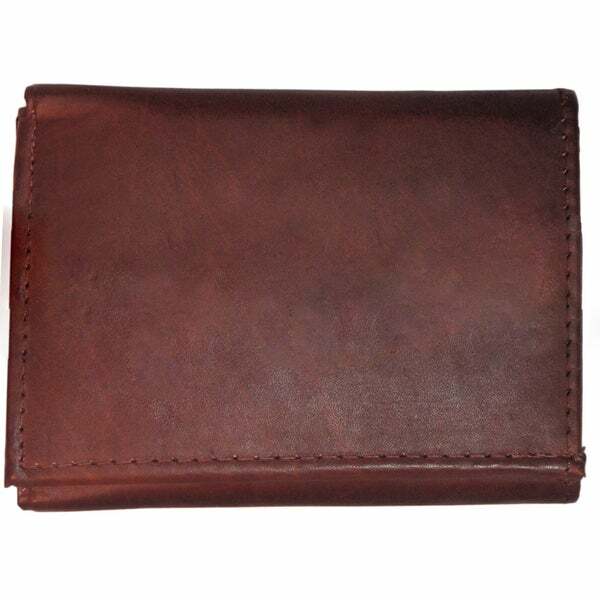 This is a great wallet -- genuine leather. It holds a lot of cards! Initially the cards are a tight fit but the leather softened quickly and the cards are easy to get in and out now. Classic style wallet. Rich brown leather that is sturdy but soft. Folds nicely. nice looking wallet. big enough to carry all the important things...but not so big it doesn't fit in your back pocket. Gave this men's wallet as gifts. The leather is very nice. The color of the leather is unique and quite handsome. I am sure the recipients will like this gift. I bought this to replace my old wallet. I went back to the trifold design.It is the perfect size and holds all my cards that I carry perfectly.I really like the split money feature. I would highly recommend this product. I really like the wallet because of the zippered bills slot. Edit: after I have had this wallet for almost a year the zipper compartment has the zipper sticking and getting hard to open. I will not be buying this one again. Next time I will stick to an old school wallet. Avoid this none. The wallet has a horrible odor that makes it unusable. The card slots are about 1/8 of an inch too narrow - it takes a lot of effort to put a credit card in or remove it. Finally, it is too thick, at least for me. I prefer a thin wallet. This got thrown in the Goodwill box. I would rather use my old, beat-up wallet. the slots are small, but it is made well. I purchased it for a Christmas gift, but it arrived to late, even though it was ordered in time for delivery. So I have a gift for this Christmas. Good soft leather with very good stitching. It has been in my back pocket for a couple of years and is still in great shape. Great price and very good quality. Bought as a gift to my son. He loved it! I would recommend this product to everyone. Very nicely made and a great price too boot. These are great quality. They are definitely going to hold up for a long time. Great purchase! Exactly as advertised and came in super quickly! Glad I ordered through overstock! "does it really have four removable photo or credit card plastic slots like it says? what does it look like? why doesnt it show?" This wallet has 4 slots in the middle for credit cards and then it also has 4 more on the right fold its not removable but you can have 8 cards in it and one single photo space. "I see that it is a trifold, but does the bigger pocket (for the cash) have a divider? I am looking for a trifold wallet with a split cash pocket." Hello writergirl21, thank you for your inquiry. Unfortunately, the information you have requested is currently unavailable. You will receive an email notification once an answer is posted. Have a great day. "Does it have a split billfold?" Hello Sulee, this item is a trifold. Thank you for shopping with us.